Here Are the Top 30 Renderings We Have Done in 2018! 2018’s first quarter rushed past us, it’s been 3 months of hard passionate 3D rendering work. We couldn’t forget about you guys though, so we’re back again with some juicy renderings so that you can see with your own eyes the outstanding quality you can get if you decide to work with us. We also like sharing these to make our clients proud of their amazing projects and to showcase their creativity for you all to see. As always, don’t forget to congratulate the hard work of our CAD designers, who have been sweating for three months to handle all of these projects and as always, doing an amazing job to deliver them quicker than ever. Here are what we consider to be the 30 best renderings we’ve done in the last 3 months. There is going to be a little of every kind; interior and exterior renderings, floorplans, beautiful landscapes, and lots of impressive details. So without further ado, we hope you enjoy it! Remember: we order our lists based on the ones we personally like the most, while considering detail, visual graphics and creativity at the same time. If you think we should have ranked any of these higher we’ll be glad to hear your thoughts, just comment below and let us know what you think! Please note, the renderings we think are the best are towards the bottom of the page. Make sure you scroll all the way down! We start this list showcasing one of this year’s home rendering jobs we did, showing that you don’t really need to go crazy on the details and that, even with a tight budget, you can get an awesome 3D representation of your future home before it’s even built. Another beautiful home, our client wanted to see how his future home would look against a beautiful blue sky, and we did this for him. Now we want to show case this mall and its parking lot, remember that there’s no limit to what you can add to your rendering, cars and people will be really easy to input into your visualization. Also, we really like those amazing tree lines. Get a cute visualization to see just how your new business will look when it’s done. There’s no better way to figure this out than 3D renderings, 2D plans and 3D models are a thing of the past! This way you’ll know what you have to adjust to make your shop look awesome, before starting to build it. If you want, you can choose to create a rendering of a building from far away, so you can see the building in its surroundings. You know what you need, and know your clients, so you’re in the best position to know how your ideal rendering will be set. Give us some angles and other details you need, and we’ll deliver exactly what you want, while adding some extra flair from years of experience! We usually leave floorplan renderings in the last spots of our lists, but then it can seem like we forget the importance they have, as they easily indicate the whole functionality of the building with just one picture. This is not the only floorplan rendering you’ll see on this list! Another one of our clients who wanted us to render his establishment so that it looks like a photograph! He was really happy to see how good the building will look when it’s done. We also have some big clients planning and wanting to see how their store will look when it’s built. You can control lighting conditions to achieve any result you want, like getting a beautiful rendering of how the building would look at sunset. If photorealism is what you want, then you can totally get it! You can have gorgeous details and textures in your renderings if you work with us. This another building rendering we did this year, and the outcome was great. We also really loved the architect’s concept for the building with the grassed roof, it deserved to be at the start of the first 20 spots in our list! Told you we would have more amazing floorplan renderings on this list! We thought that the pool area plus that awesome garage made this floorplan really stand out. There’s space for a couple more cars in the garage there! In this rendering you can see the vibrant colors you can get when you incorporate green grass and wood. The shiny wood façade of this home wowed us, and we couldn’t leave it out of this list. Another house rendering done well, photorealism at its finest. Just look at the colors and reflections, and the natural details. When you work with us, you can choose any level of detail, and “top quality” is the specialty here at Render3DQuick! Here it is again, and we need to say it once more: what an impressive concept this architect brought to us. We really enjoy when we work with creative clients, seeing them challenge themselves (and then us!) by coming up with innovative designs is something we really enjoy about our job. Our last floorplan rendering in this quarter’s list. And it made it this far because of its beautiful color and balance. The realism in this rendering is awesome. This is the best way to showcase a house plan. Nothing can compete against these (well, maybe just a VR tour!). 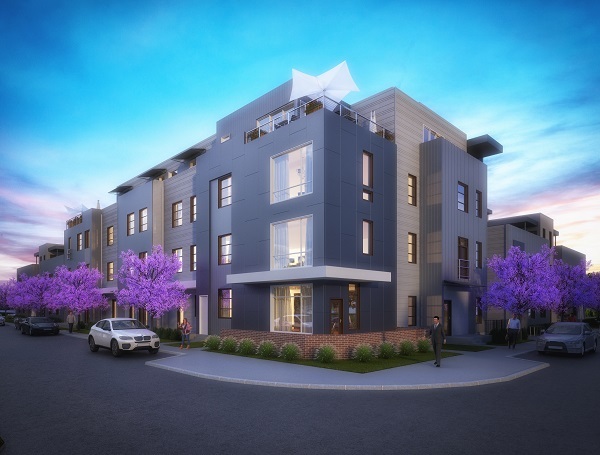 Competition grows stronger as we get closer to our top 10 renderings from the quarter, and we just think that this exterior rendering demonstrates just how photorealistic architectural visualizations can be. You can add as many natural details as you want, grass, flowers, trees. Use every bit of creativity you have to achieve the result you desire. This is how a building rendering is done. It doesn’t have to be too fancy, and sometimes, simple is better. It’s great when the client tells you to focus mostly on getting a great feel for the scale and shapes of the architecture in focus. We thought this was a really refreshing interior design, and we totally loved it. So many cool details while being so edgy and elegant at the same time. Creativity at its finest! Now we get to our top 10 renderings for the quarter, and what a better way to start than this white bedroom, filled with gorgeous shapes and texture. Notice the great light distribution around the room and those satiny pillow covers and sheets. One of the most beautiful home renderings we have done, breathtaking architecture, innovative design, charming details. It’s got everything! Now this is our kind of living room! So spacious and elegant. Our interior design clients never stop impressing us with their work. And we always do our best to keep up with them. Great view too! Here’s another display of rendering photorealism and home architecture working together to deliver an awesome house impression. Have you noticed how fierce the competition is growing in our final top 10 renderings? We like to say that there’s no thing as “too much detail”, especially when it comes to selling a property, you want it to feel homely and get people imagining what it would be like to live there. This room rendering ended up being so lovely, the details in the table, the walls and outside make it almost come alive. Now this is how you do interior design! It doesn’t just need to be about how real your renderings look, sometimes we don’t want them to look like a photograph. In special cases when our clients want their rendering to transmit something specific, we do our best to make them happy and can add a touch of artistic flare like in the colors and soft glow of this rendering. This client wanted a colorful rendering of his home against a deep sunset with strong lights. 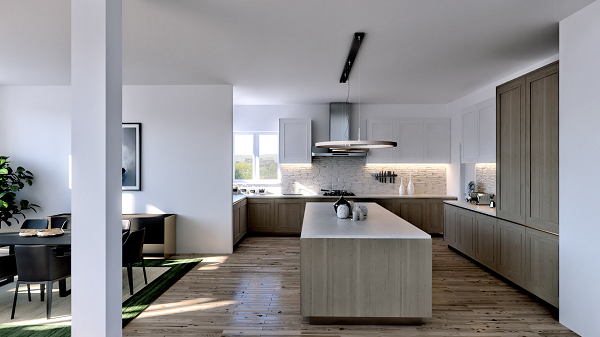 Our #3 is a bright interior rendering filled with life, a beautiful kitchen and dining room, a great job done by the interior designer in collaboration with our team to come up with this awesome rendering. How amazing is that granite bench? You could almost reach out and touch it. This was our favorite interior rendering for the quarter, the texture, reflects, light, shadows, everything was so well done in this rendering. Cheers to our amazing design team! Sometimes they’re almost too good to be true. And we finally got to the No. 1!! This one made us really proud, the colors and lighting are simply exquisite. All the environmental detail plus the architectural design blend perfectly to create this delightful rendering. So that was it for the first quarter of 2018, if you’ve been inspired by looking through these renderings and want to set up a project with us don’t hesitate to click here or call on 1-877-350-3490 to get a free quote on your next rendering project. The project of your dreams could be a part of next month’s top renderings! Newer PostThese are our 20 favorite renderings from May and June!